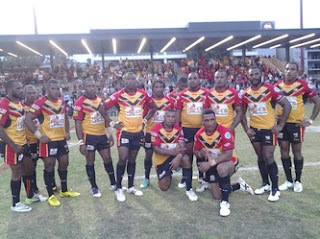 IF the Kumuls end up playing Fiji in the Rugby League World Cup next month it could be another tough task. The Fiji Bati will be taking a powerful forward pack to the tournament and could have as many as 13 National Rugby League first graders in their game day 17. The Kumuls can only boast four NRL top grade players and three are under injury clouds. David Mead (Gold Coast Titans), Neville Costigan (Newcastle Knights) and Ray Thompson (North Queensland Cowboys) are either recovering from serious injury or due to go under the knife at the end of the season. Meanwhile, the Fiji National Rugby League confirmed 18 players in the NRL and Super League have declared their interest in playing for the national side at the World Cup from October 26 to November 30. Veteran Petero Civoniceva, former Bati skipper Wes Naiqama, brother Kevin, Jason Bukuya, Marika Koroibete, the Sims brothers – Ashton, Korbin and Tariq – Sisa Waqa, Lote Tuqiri, Jacob Loko, Semi Radradra, Jason Bukuya and Akuila Uate are some players who are cleared to play for Fiji. Star player Jarryd Hayne (pictured left) remains in the frame despite not being on the list. Parramatta Eels player Hayne and South Sydney Rabbitohs five-eighth John Sutton (pictured right) are being eyed by the Kangaroos. FNRL general manager Tomi Finau said if the two failed to make the Australian team, they would play for the national side. 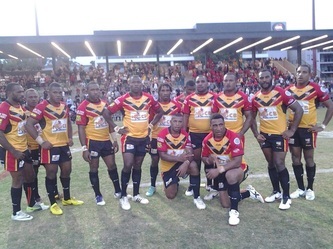 PNG would have to finish second in Pool B while Fiji would need to finish third in Pool A for the match-up to occur. The Kumuls have New Zealand, France and Samoa in their pool while Fiji have Australia, England and Ireland.